For the first time in Korean movie history, a Korean movie with a remarkable record of the highest percentage of reserved tickets (83%), first week of box office record (490,000 people), and highest daily audience rate (919,027), was released in the U.S on the 19th. In Boston, this movie, “Secretly Greatly,” will be released at AMC LOWES BOSTON COMMON (175 Tremont St, Boston, MA 02111) on the 26th. The popularity of the film is impacted by the fans of the main actor Kim Soo-Hyun who is a rising star in South Korea through his successful role in Korean drama “The Moon Embracing the Sun,” as well as the fans of Hyoung Sung-Han’s 400,000,000 viewed comic which is the original story for this movie. 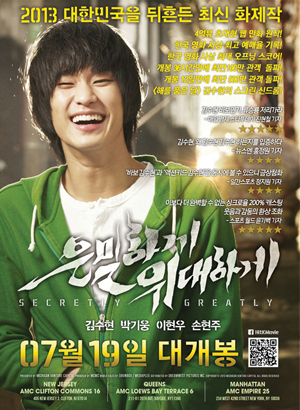 "Secretly Greatly" is a movie of comedic events that happen among three North-Korean spies. They are living as a town fool, a rock star, and a student. The real climax is Kim Soo-Hyun's dramatic transformation in the second half of the movie. The flawless acting of Lee Hyun-Woo, Park Ki-Woong, Son Hyun-Ju is another attraction for this movie. "Secretly Greatly" is the new hot topic among teenage audiences. In one movie reservation site, 15% of buyers were dads reserving tickets for their young daughters. Also, this movie was appointed as the movie suitable for everyone including families and elders. Because of its popularity with a variety of viewers, the movie has been in the box office for an extended time. The movie distribution company, Well Go USA Entertainment announced that "Secretly Greatly" was released in Norwalk, Orange, Las Vegas, Seattle, Chicago, New York, Dallas, and Hawaii on the 19th and it will premiere in San Diego, Boston, San Francisco, Vancouver, and Toronto on the 26th.